Welcome to the Massachusetts Fall Foliage Guide, an informative guide to Massachusetts’ most popular fall foliage driving tours and events. Massachusetts offers some of the most beautiful fall foliage in the United States. Check out Fall Foliage FAQs. Check out our Massachusetts Fall Foliage Current Report. Make reservations well in advance, especially if you plan to visit during the first two weekends of October. Plan to visit during midweek periods when traffic and crowds are at a minimum. 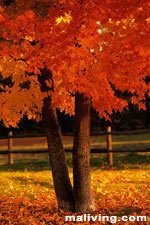 Innkeepers will often require a minimum two-night or three-night stay during foliage season, especially on weekends. Expect to make an advance deposit to guaranty your lodging reservation, and be sure you understand the innkeeper’s policy on refunds for cancellations. Plan a multi-night stay in a hotel/motel, inn, or resort area with day trips to surrounding sites and attractions. Plan to visit local events that include fall foliage festivals, apple and harvest festivals, craft fairs, and antique shows. Pick your driving routes ahead of time to ensure the most visibility. It can get very frustrating driving around in circles and not finding what you are looking for. Expect to wait in line at attractions and restaurants, especially on weekends and during peak times. Plan a walk, hike, or bike tour amid the vibrantly colored leaves. You can’t beat the smell in the air, especially when you find yourself in a grove of White Birches dappled with bright golden leaves!